Female friendships flourish over a tasty meal and a heart to heart. There’s no better place to celebrate then Dumpling Darling. Leave the men behind and crack that bottle of wine. 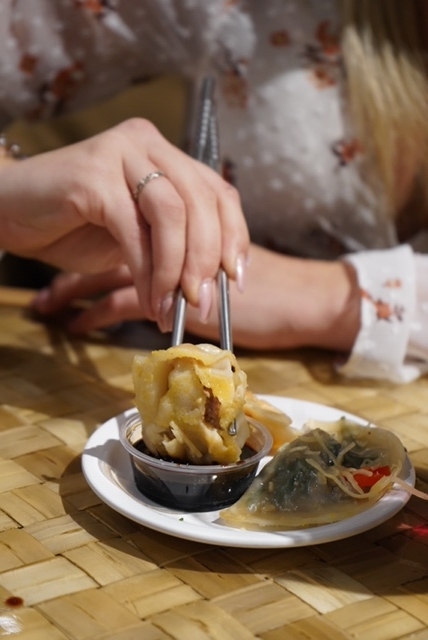 March is International Women’s Month, and it’s time to celebrate, dumpling style. Celebrating the women we love doesn’t have to happen just once a year. Galentine’s Day has passed, but the celebration doesn’t stop there. Let’s face it, best friends are better than soulmates. They deserve the world and not just a day. With several busy schedules to keep in mind, a night would have to suffice. Clink! 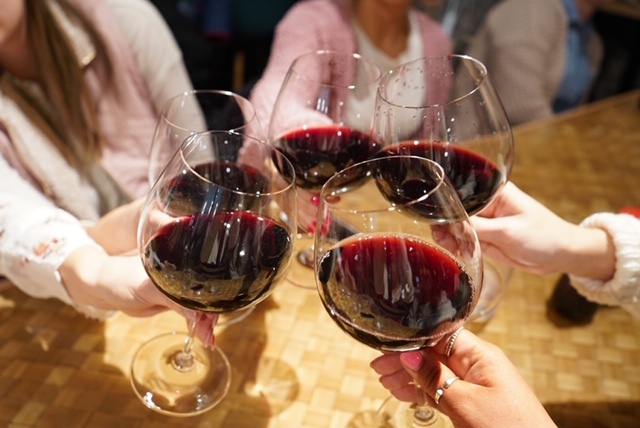 Gal pals enjoy wine during their friendship celebration. My friends and I decided International Women’s Month was the perfect excuse to get together and enjoy each other’s company. By some miracle we found a night to get together, every single one of us. We searched for Des Moines restaurants best deals. Ceviche was offering buy one get one martinis and The Social Club was hosting a comedy show Saturday night. 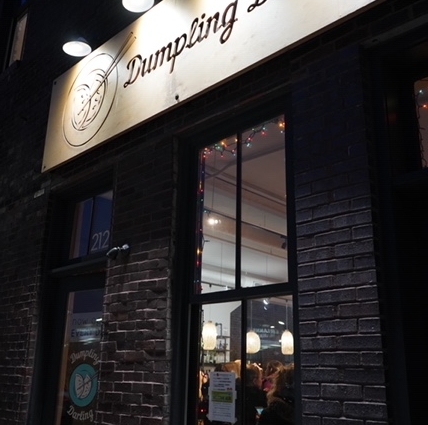 With several great options to choose from, we landed on a local favorite, Dumpling Darling. Dumpling Darling is a female owned restaurant that prides itself on environmental sustainability and bringing people together with food. 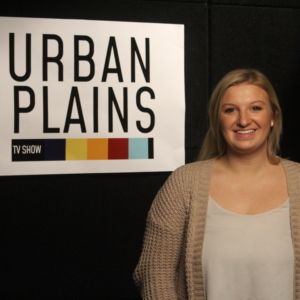 Leslie Triplett, the owner of Dumpling Darling, admits to a traveling addiction and a dumpling obsession that inspired her to open the restaurant not only in Iowa City, but right here in Des Moines. Dumpling Darling offers everything from Avocado Rangoon, Pork and Cabbage, all the way to fried Mac N’ Cheese dumplings. Not to mention the $5 drink deals and dessert dumpling flights to top off the celebration. The options were endless, and according to Triplett, just about anything can be put in a dumpling. “I lived in Korea for a year as a teacher, and my experiences there intrigued me to bring back these wonderful flavors and introduce new ideas,” Triplett explains. Her cultural experiences have brought a wonderful creation to the state of Iowa. Triplett enjoys what she does and it’s evident in the atmosphere and the food. That is something to celebrate. The eight of us arrived at our table fashionably early, right before 6 p.m. The place was packed from wall to wall, conversation was booming, and drinks were flowing from the bar. The room was filled with hints of fresh chicken and vegetables. 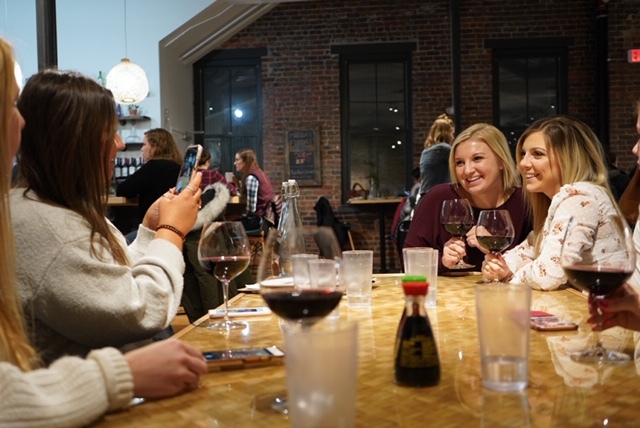 The restaurant is an open floor plan with exposed brick walls and concrete floors, so sound travels forcefully and echoes quickly to the middle of the room. It was slightly overwhelming, but the atmosphere gave off an undeniable energy. It’s not intimate to say the least, but that’s not what any of us were looking for. We were in the mood to socialize and have a good time with our best friends, so the hustle bustle surrounding us was a happy addition to the ambience. The busy restaurant implies the success of Triplett and her female owned business. Triplett is an encouragement to women because she does what brings her joy. It’s plain and simple. She poured her heart and soul into it, just as she does in her friendships. Triplett got by with a little help from her friends. Her dumpling restaurant was just a distant idea, until her friends’ constant encouragement and support made her really consider the decision when returning from Korea. “I feel like a big part of Dumpling Darling’s vibe and determination is that women power this business,” Triplett said. Celebrating best friends should not be confined to a holiday. Female friendships are important. These friendships are the safest of spaces, while simultaneously encouraging growth. It is a constant love and appreciation for the people who keep us moving toward our goals. With full hearts and empty stomachs, we decided to share a few flights of dumplings. We agreed on a mega flight, that included 40 dumplings, half steamed and half fried. While waiting we were able to catch up and talk about our plans for post graduation. It was exciting to hear about my friend’s dreams turning into reality, but sad to think about the possibility of them being states away, and not just a few steps. Our food arrived. It seemed like a quick turn around, but it was probably because we were deep in conversation, and not to worry; we got the perfect Instagram in time. Due to a rush to get to our evening movie, we skipped out on dessert. We were going to see “Isn’t it Romantic” starring Rebel Wilson. If our time together wasn’t enough, this movie was the perfect reminder of how important female friendships really are. Men come and go, but girl-friends are forever. If time is not a concern, be sure to check out the dessert dumplings for yourself. They were offering a cherry rose dumpling, as well as a raspberry cheesecake dumpling. If those flavors don’t satisfy your sweet tooth, they have a variety of dessert dumplings on the daily. Hopefully, by the time the work week rolls around, you’ll still have that friendship buzz and dumpling daydreams to keep you going. After our Galentine’s day celebration, I know I have the best friends in the world, and for me, that’s enough.